Teppo Jutsu LLC, located in The Woodlands, Texas is a small custom ammunition design and firearms manufacturing company founded in 2000 by Marty ter Weeme. They design custom ammunition (“wildcats”) and build firearms and accessories for professional and recreational purposes alike. They seek to offer the greatest amount of firepower possible from existing firearms platforms and base a lot of their work around the “AR” rifle series originated by Gene Stoner, as its modular system allows for extensive modification without changing the basic operating system. There are four unique cartridges currently available or under development, as described below. This is based on the AR-15 action using the standard gas system. The case uses the new 6.8 x 43 Remington SPC experimental military round necked-out to 7.62 mm calibre (and retains the original headstamp). As such, it requires the use of dedicated magazines. The key advantage the .30 HRT offers over the 6.8 mm is flexibility due to the wide range of .30 calibre bullets available. These range from the 110 grain (7.1g) Hornady V-Max (as shown in the photo; at about 2,700 fps - 820 m/s) up to 240 grain (15.6g) Sierra Hollow Point Boat Tail, loaded to subsonic velocities to rival the specialist .300 Whisper cartridge for silenced sniping rifles. Case length is 40.8 mm, rim and body diameter 10.6 mm, neck diameter 8.3 mm. This is also designed for the AR-15 action. The .338 Spectre cartridge is based on the Starline 10 mm Magnum case (and retains that headstamp) which has the same diameter as the 6.8 x 43 Rem SPC, so requires the use of dedicated magazines. It may therefore be regarded as a shorter, necked-out version of the .30 HRT. Case length is 31.5 mm, rim diameter 10.6 mm, body diameter 10.8 mm, neck diam 9.2 mm. Bullet choice is wide, ranging from 160 grain (10.4g) Barnes X Spitzers, through 180 grain (11.7g) BST to 300 grain (19.4g) HPBT Match King rifle bullets. Overall loaded length is similar to the ubiquitous 7.62 x 39 M43 and .223 Remington. Furthermore, it allows the user to employ existing suppressors for the 9 mm without modification, providing enhanced tactical firepower. The standard .223 lower receiver for the AR-15 can be used without modification, and the rifle will function in both semi and full automatic modes. In addition to the AR-15 weapons platform, several other types of firearms can be made to accept this cartridge, including the Mini-14, T/C Encore and various bolt and pump action rifles. The magazine for the AK-74SU “Krinkov” will accept the .338 Spectre cartridge, and Teppo Jutsu are working on the first prototype rifle in this cartridge. Ballistic performance is comparable to the .357 Herrett, .357 Maximum or .35 Remington or even the 180 grain load for the .44 Magnum. In the 16" (406 mm) barrel carbine, the .338 Spectre will launch the 180-grain BST at 1,800 fps. By loading the 225-grain Hornady Spire Point bullet at subsonic velocities for suppressed application, the muzzle energy approaches 540 foot-pounds, rivaling the high velocity 115 grain (7.45g) load for the 9mm Parabellum. 6.5mm sabot loadings are also being investigated. The .458 SOCOM cartridge was developed in order to provide superior stopping power for AR-15 based weapon systems, in view of the questionable effectiveness of the 5.56 mm round in recent conflicts. A new cartridge in .458 calibre was selected as this not only offers considerable stopping power but also offers the user a vast choice of commercially available bullets, ranging from 300 gr. (19.4g) HP and Spitzers, 405 gr. (26.2g) FN, up to 500 gr. (32.4g) Solids and Tungsten Core RN. A case of the same diameter as the .50AE that would completely fill the AR-15 magazine seemed the right choice, but the rim needed further reducing to avoid much work to the bolt lugs. The use of an even more drastically rebated rim seemed the solution, and the 0.473” (12.0 mm) diameter rim employed by the .308 and .30-06 based cartridges was chosen, as this would allow easy retrofit of bolt action rifles in this calibre. The .425 Westley Richards cartridge was identified as the ideal basis as it had all the proper measurements, but it was too costly. So Starline Brass agreed to a pre-production run of .50AE brass, but unformed, untrimmed and with the rim rebated to 0.473”. It is headstamped: * 458 * SOCOM. Case length is 39.9 mm, rim diameter 11.9 mm, body diameter 13.6 mm, neck diameter 12.3 mm. Initial loads, and the overall case, were designed around the Barnes 300 gr. X Spitzer, as this appeared to be the lightest spitzer bullet available. This determined the case length of 40 mm to ensure that the cartridge was short enough to still function through the AR magazine. The .458 SOCOM uses standard AR-15 magazines with no modification. The 20-rd magazines will hold 7 rounds, the 30’s will hold 10 rounds, and the 40-rd .223 magazines will hold 15 rounds of .458 SOCOM ammunition. The AK-47 can also be chambered in this calibre. 500 gr (32.4g) Speer AGS-T at 1,300 fps (396 m/s) 600 gr (38.9g) Barnes Original at 900 ft/sec (274 m/s): (CorBon factory load equivalent. Subsonic; complete combustion in 10.5 inch barrel). The .500 Phantom has been designed specifically for the AR-10. This is the largest cartridge case that will function through the AR-10 action. It uses the standard magnum rim size so the OEM bolts designed for use with the WSM or RSAUM line of cartridges can be used without further modification. This offers the greatest amount of firepower currently available in any AR-based rifle using the standard magazine: it uses unmodified OEM magazines, a 20 round .308 mag holding 8 .500 rounds. The case is headstamped: PHANTOM 500. Case length is 38.7 mm, rim diameter 13.3 mm, body diameter 15.6 mm, neck diameter 14.0 mm. It is capable of firing bullets of between 350 and 975 grains (22.7 – 63.2 g). In addition, the 750-grain Amax as well as numerous military projectiles can be loaded at subsonic velocity for suppressed purposes (the A-Max loading is too long for the action so manual loading is required), and the sabot load using the .30 calibre projectile should fire the Sierra 168-grain Hollow Point Boat Tail Match King at close to 3,200 fps. 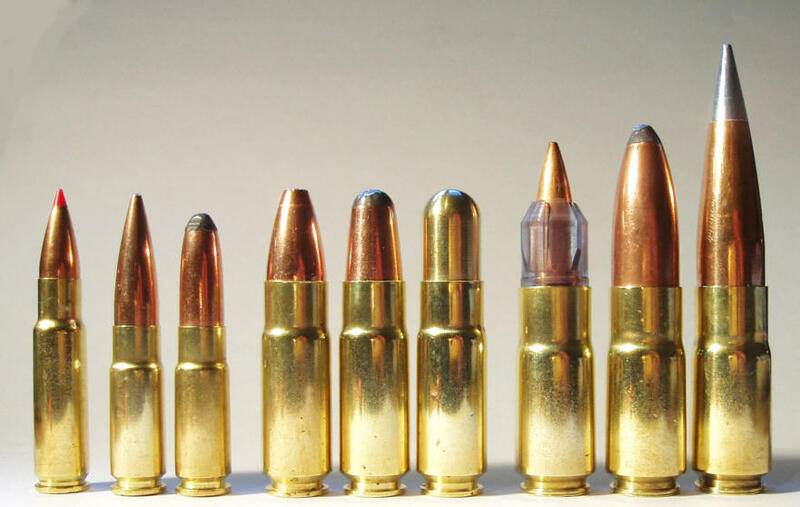 From left to right: .30 HRT (110 grain Hornady V-Max); .338 Spectre – 300 grain Sierra Hollow Point Boat Tail Match King) and 300 grain HAWK Round Nose; .458 SOCOM – 300 grain Barnes X Spitzer, 400 grain Barnes Round Nose Solid and 600 grain Barnes Original; .500 Phantom - 168 grain Sierra HPBTMK (saboted), 700 grain HAWK and 750 grain Hornady A-Max.